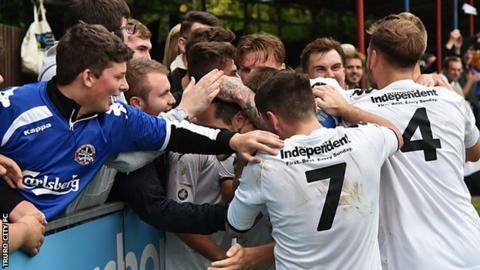 Truro City forward Cody Cooke hopes they can sell out Charlton's away end when the National League South side go to the League One club in the FA Cup. The Cornish side could be allocated as many as 4,000 tickets for the tie at the former Premier League club. Truro-based fans face a 600-mile round trip for the tie, the first time the club has ever made the first round. "When Charlton came out of the draw we went through the roof, everyone's excited," Cooke told BBC Cornwall. "If we can take a big tribe from Cornwall up there, and possibly sell out the away end, it's going to be huge for everyone involved, not just the club but the city as a whole." The tie has been moved to Sunday 5 November and is the first time a club from Cornwall has made the first round of the FA Cup since 1969. And Cooke hopes the cup run will keep their good run of form in the league going - City are third in the sixth tier and have won nine of their past 10 games in all competitions. "It's a bit of a weird period as we've still got two games and two weeks between now and the FA Cup and it's about getting back to what we're doing. "Hopefully the cup run will do us well in the league and continue the form that we're in. "We haven't lost for 10 games and if we can continue that run into the FA Cup as well it's going to be good for everyone."